Amid Huawei CFO Case, Canada Is Squeezed Between China And U.S. Canada is under pressure from the two rival powers over the Meng Wanzhou extradition case. 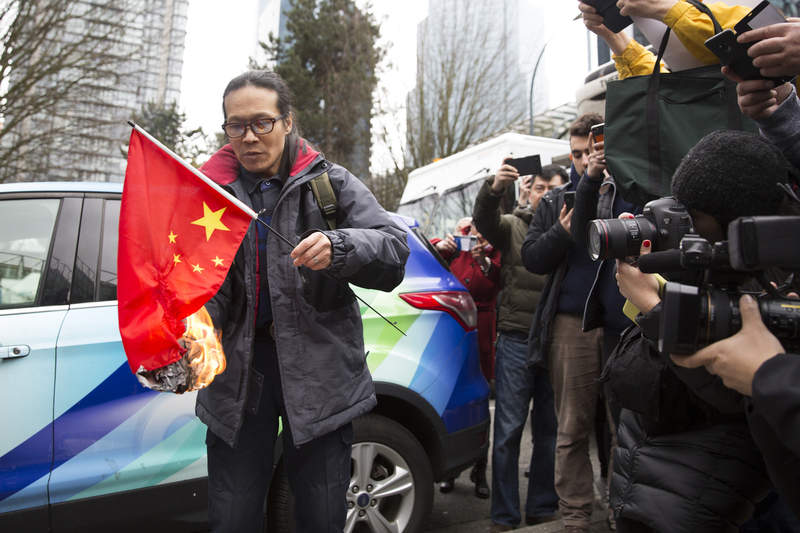 Kuang Yang burns a Chinese flag to protest human rights abuses, outside British Columbia Supreme Court in Vancouver on March 6, as Huawei Chief Financial Officer Meng Wanzhou appears in court. "Chinese use them as the hostage to negotiate a deal with Canada," said Huang, who immigrated to Canada from mainland China 20 years ago. Now Canada finds itself squeezed between two of the world's most powerful countries. Canada agreed to open a case to decide whether to extradite her to the U.S.
"Canada played totally by the rulebook here," says Jonathan Manthorpe, author of Claws of the Panda: Beijing's Campaign of Influence and Intimidation in Canada. "We have an international extradition treaty with the U.S., we followed it by the letter." That has placed Canada directly in China's crosshairs. Beijing says Canada and the U.S. have abused the extradition process and has threatened to retaliate. Already, China has blocked hundreds of millions of dollars' worth of canola oil imports from Winnipeg, Manitoba. "The Trudeau government came with more open arms towards China and really wanted to engage better" than previous Canadian governments, says Laura Dawson, director of the Canada Institute at the Wilson Center, a think tank in Washington. "The economic case is there for closer engagement with China in sectors like canola, pork ... soybeans, etc." But that effort will now likely go into cold storage because of Meng's extradition case. Meng is the daughter of Huawei founder Ren Zhengfei, a former member of China's People's Liberation Army. Huawei is one of China's most important technology companies and seen as a leader in the race for supremacy in 5G, the next generation of mobile networks. Huawei Chief Financial Officer Meng Wanzhou leaves her Vancouver home with security detail to appear in British Columbia Supreme Court, in Vancouver, on March 6. "Canada has captured a Chinese 'princess' from an iconic company and has acted at the behest of the United States," Evans says. "To many Chinese that's been deeply upsetting." Meng's arrest is seen as part of a larger effort by the U.S. to contain Huawei. The White House has barred U.S. government agencies and contractors from using the Chinese company's equipment. Washington also wants allies, including Canada, to bar Huawei's equipment when they roll out their 5G networks. The Meng case comes at a time when the U.S. and China are involved in a bitter trade dispute. Evans says it became clear her arrest was politically motivated when President Trump said that he would consider intervening in Meng's case if it helped secure a trade deal with China. "There is widespread feeling in Canada we've been thrown under the bus by our American friends ... that Canada is caught in the middle," he says. "This was not something that Canada wanted, we've been unwitting and unwilling to get pulled into this. But we're now in the vortex of a major storm." Meng's extradition process could drag on for months, possibly years, and China could continue to ratchet up the pressure. The Trudeau government has limited options to contain the collateral damage, including patient diplomacy. Still, author Manthorpe says the crisis may actually be a good thing for Canada. "We have been in a state of self-delusion about our relationship with China for a long, long time," he says, and "China has been using us and has been setting up agents of influence and otherwise operating in Canada against our interests for 60 or 70 years." Manthorpe says this is a good opportunity for Canada to reassess its relationships with both China and the U.S., and build stronger ties with other "middle powers" like Japan, Taiwan and Chile. Meng's lawyers say the case is politically motivated. McCallum visited Kovrig and Spavor earlier this year and said they were being regularly interrogated "on the order of four hours a day." He said the interrogations could go on for up to six months under the Chinese extrajudicial system. McCallum was forced to resign in late January after saying it "would be great" for Canada if the U.S. dropped its request to extradite Meng.